It was another spring-like fall day in Baltimore on Tuesday, and I had a few spare hours in the afternoon for a bike ride. I left the house with vague plans for ice cream, but I took a left instead of a right at the intersection of the grocery store and hardware store, and ended up heading south and east on streets I’m not used to–the very best. I made my decisions based on streets that had fewer cars on them, and I found myself riding Lafayette as far east as it goes from the east side of the cemetery. I pedaled up and down, thought briefly about counting vacant homes as I went but decided to have a wide rather than focused vision, and felt that feeling you only get when you’re wandering with nowhere to go in a city you realize you still don’t really know. And then Lafayette ended and I took the curve onto Lanvale, sneaking up behind that American Brewery castle where so many good things are happening. I snapped this picture before crossing N. Patterson Park. There’s the front of these vacant homes, but if you catch a glimpse of the back it’s like seeing under the skin. You have to slow down, peek inside and around broken windows and collapsing roofs, and I wonder what the stories are of each of these places. We talk about their future in this city–how to turn Vacants to Value, maybe tear them down and make urban farms, do something, because to life in the skeletons isn’t good for any of us. I wonder about the past, and I want every story of every life that passed through here, and what happened to bring it to this. It was quiet over here, just a few neighbors with their how-you-doin’s, and I felt chastened by how little I understood. Pedal, pedal, pedal, and then I was riding past the school, crossing that memorial to the French-Indian war (I think), going through the park, pedal pedal pedal, and I was in Canton, having a cup of coffee, riding home through Fells to see if the new donut place was open, past the prison that’s now closed–where did they take everybody?–and back home. All of these places are connected, no more than an hour’s ride from end to end on this particular ride. This picture sure can’t get everything into the frame. 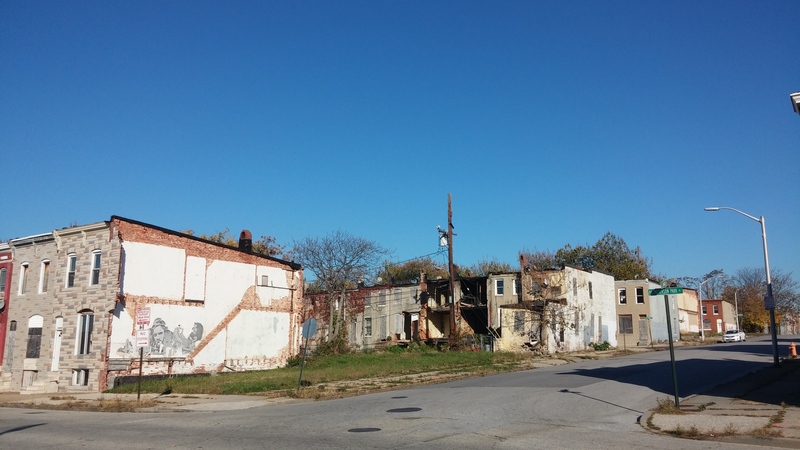 This entry was posted in blight and tagged Baltimore, blight, East Baltimore, Patterson Park, vacant homes. Bookmark the permalink.